Florida governor Rick Scott, one of the sharpest critics of President Obama’s healthcare law, announced late Wednesday that he wanted the state to participate in an optional portion of the law after all.Florida should accept federal funds to expand Medicaid coverage in the state, Scott said at a news conference, in a stunning reversal. “While the federal government is committed to paying 100% of the cost of new people in Medicaid, I cannot, in good conscience, deny the uninsured access to care,” Scott said. The Republican-led legislature must approve the measure for it to take effect. Conservative opponents of “Obamacare” reacted with disappointment and anger. The Obama healthcare law expands Medicaid eligibility to families with incomes at 133% of the poverty level. That could mean 1.95m more Florida enrollees over five years, when Medicaid and other subsidized programs are included, according to the Florida Agency for Health Care Administration. Scott’s political identity was built on opposition to the Obama healthcare law. He made a fortune – hundreds of millions – by building a network of private hospitals. 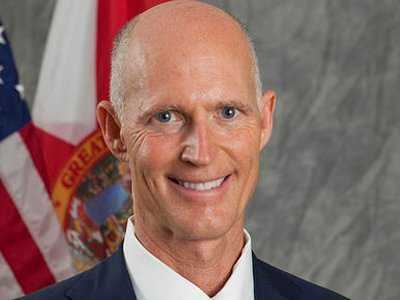 He has repeatedly told Florida voters that the federal healthcare law would limit patient choice and cost taxpayers tens of billions of dollars. Erickson tied the decision of Scott, who is up for reelection in 2014, to a desire to remain the governor of Florida. “Governor Scott is interested in getting re-elected and has terrible poll numbers,” Erickson wrote. “No doubt part of this decision has to do with his wanting to get re-elected. Scott’s approval rating has never topped 50%, and his governor’s seat was considered to be one of the most vulnerable in the country. “It is a sad day for conservatives,” Erickson wrote. Scott said the move was in line with the country’s greatness. “America’s greatness is largely because of how we value the weakest among us,” he said in his statement. Florida joined 25 other states in saying no to setting up a state-run health insurance exchange, the second optional prong of the Affordable Care Act.